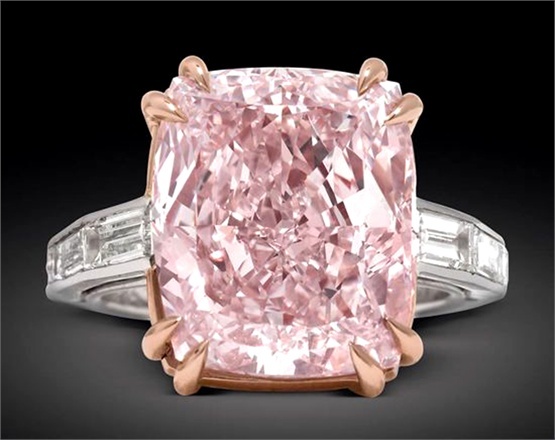 The rarity of pink diamonds make them unique in the world, but the diamonds that have made headlines over the years are famous not just for their large carat sizes or incredible stories but for the way they were found. In1905 the largest rough diamond – the Cullinan– was found in South Africa. It weighed in at an unimaginable 3,106.75 carats and took its name from the mine where it was found. The Asscher Brothers of Amsterdam cut it into 105 diamonds, some of which became part of the English Crown. The Excelsior is the second largest diamond, but it is lesser known. Unfortunately the tragic decision was made to cut it into stones that were too small and didn’t do justice to the original 971-carat stonein its entirety. The third-largest is the Gran Mogul and it was discovered in Indiabetween 1650 and 1658. It was presented to Shah Jehan, the fifth Mughal Emperor of India. The 787.5-carat diamond was cut imperfectly and it had to be reduced to 280 carats. After that time nobody is quite sure what happened to it. Some say that other large, famous diamonds like the Koh-I-Noor or the Orlov had come from the Gran Mogul. The Promise Lesotho diamond is a more recent discovery. This 603-carat diamond was found in South Africa in 2006 and is free of imperfections. London-based jeweler Laurence Graff bought it at auction for $12.36 million and cut it into 26 smaller diamonds to create a necklace worth $50 million. The fifth-largest diamond in the world is the Golden Jubilee, and when it was found in 1985 it overtook the Cullinan I, the largest gem to come of the Cullinan. Made from a 755-carat stone mined in South Africa, it was ably cut by Gabi Tolkowski. Its 545.67 carats make it the largest faceted diamond in the world. So many fascinating and magical stories that keep the dream alive – until the next extraordinary discovery.